Chris Hedges: "U.S. Citizens Are Living In An Inverted Totalitarian Country"
The mainstream media deflects attention from where power resides: corporations, not with the leaders of the free world. The arguments posed by Chris Hedges, that the U.S. is neither a democracy nor a republic but a totalitarian state that can now assassinate its citizens at will, are pertinent ones. Scary ones. Especially as consecutive governments seem equally as impotent to invoke any real change for the States. If the media won’t stand up to the marionettes who pull the strings of the conglomerates causing deep, indelible polarisation in the world abound; then so we must act. Together. Listen to the full interview in our weekly Newsvoice Think podcast. 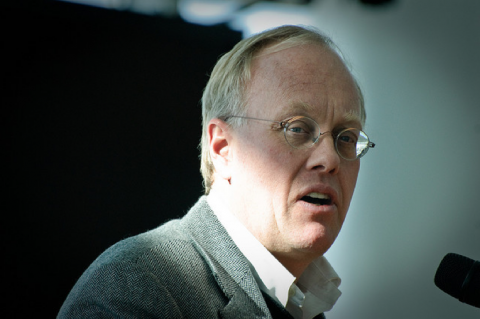 We were delighted to have Chris Hedges on an episode of the Newsvoice Think podcast as we seek to broadcast perspectives from all sides of the political spectrum. Right, left, red, blue and purple. As a columnist with Truthdig, and a big advocate of independent media. Chris Hedges was the perfect interviewee for us to draw on the benefits of crowdsourced journalism and the challenges facing sites at the mercy of Facebook, Google and Twitter algorithms. Chris’s ire against the corporate interest of Facebook et al didn’t let up saying dissident voices were being shut down and that corporate oligarchs were only too happy to let them. The neutralisation of the media platforms that seek to provide independent opinion on U.S. current affairs is in full pelt. North Korea was the hot topic in 2017. Commentators said it was like a return to the days of the Cold War. But Hedges pointed that we need to remember what happened during the Korean War — how the North was flattened by U.S. bombs — and that as a result they, as a nation, suffer from an almost psychosis as a result. Trump, he said, is an imbecile and only deals in bombast, threats and rhetoric. Not surprisingly, Trump got it hard from Hedges. Describing his administration as a “kleptocracy” who will seek to attack immigrants and up the xenophobia stakes as it distracts and covers for the unadulterated theft of U.S. natural resources. As young people look to estimable journalists, activists and politicians in the States to help give them a voice, Hedges sees the democratic system as utterly futile. Encouraging mass civil disobedience instead, the ex-NY Times foreign correspondent states that railroads should be blocked and shutting down corporate buildings, for example, is the only way forward. The perennial argument between Republicans and Democrats is just that; is the U.S. a Republic or a Democracy? Hedges thinks neither. He told Newsvoice that the States is an inverted totalitarian country where the government regards the public as “irrelevant”. Unlike Ben Wizner from the ACLU who sees hope in delaying Net Neutrality, at least until a new administration is in power, Chris feels it is hopeless — that it is a dead duck, and as Net Neutrality slows down independent media platforms, the public will be at the behest of corporate social media sites such as Facebook who’ll increasingly deem what you do and don’t read or see. You can read more of Chris’ work at Truthdig where he has a weekly column every Monday.